I was heartbroken today when I found out that Coming Attractions Bridal & Formal was closing. You've probably heard of them, even if you don't know their name. Amber Vinson, the Dallas nurse who contracted the Ebola virus in October, visited Coming Attractions for a fitting for her wedding gown while she was home in Ohio. When news broke that Amber had contracted Ebola, the effect on the bridal shop was devastating. Anna Younker, the owner, closed her business for 21 days to completely disinfect the shop and all of its contents at her own expense. She also lost over $100,000 in business at a critical time of the year. Even Amber cancelled her order. Insurance didn't cover any of the losses. Amber survived. No one else got sick. But Coming Attractions is closing. "I am sad to announce that Coming Attractions Bridal & Formal is being forced to wind down its operations after thirty years of service due to the devastating effect that recent events have had on our business. Despite our best efforts, we simply have been unable to recover. "If you have a dress currently on order with us or you are planning on placing an order, please do not worry. Coming Attractions will remain open until all existing orders are complete. If you are planning on placing an order all orders must be placed by January 31st, 2015. We will contact you when your merchandise arrives and is ready for pickup. We will operate under normal business hours through January. Beginning February 1st, our business hours will change. "If you have any questions about your order or any other concerns, please stop in our store, email me at anna@cabridal.com, or message us on Facebook. "The decision for me to close was not easy for me. Over the years I have met and worked with the most amazing brides, mothers of brides, bridesmaids, prom girls and many other wonderful people. "I want to thank all our customers, the people in our community and the well wishers from afar for being so supportive. Your kind words and loyalty have been great comfort. "I also want to thank my amazing staff for all of their hard work and dedication to our customers and our business. I appreciate your understanding and support." I called Anna today after hearing the news that they were closing, and asked for her permission to set up this fundraiser. She was very grateful but declined, saying she just couldn't ask people to help. I persuaded her. Here is my goal - I hope to raise enough that Anna can place orders for inventory for the upcoming bridal season. This is the time of the year she has to do it. If she can't, she'll be forced to go out of business, and her four employees with be out of a job. I don't want that. It will take at least $60,000 to keep them going. I've set the goal at only $20,000, but I'd love to beat it. Will you help? And share? Thank you so much! Thanks to an extremely generous donor, we have now raised an even $10,000 for Anna and Coming Attractions!!!! Thank you all so very, very much for getting us to this milestone. Anna is beyond grateful to you all. Thank you, thank you, thank you for helping me help her. I love you all! We got a lot of press coverage last night as I presented the first check to Anna at the store and got to meet her and share lots of hugs. Please, please, share again. This will probably be the last time the media covers the story, so it's now or never. Thank you all so much - I adore you and I'm overwhelmed at the support you've already shown. $9,200 raised in EIGHT DAYS! I know we can hit our goal if everyone shares just a few more times. Love you all! Local (Cleveland) television Channels 5, 8 and 19 came out tonight as I met Anna for the first time and presented a check for $7,700. Tune in at 10:00 for Channel 8 and 11:00 for Channels 5 and 19 and keep your fingers crossed that the story makes it on air. This could really give our campaign a boost, so please share! 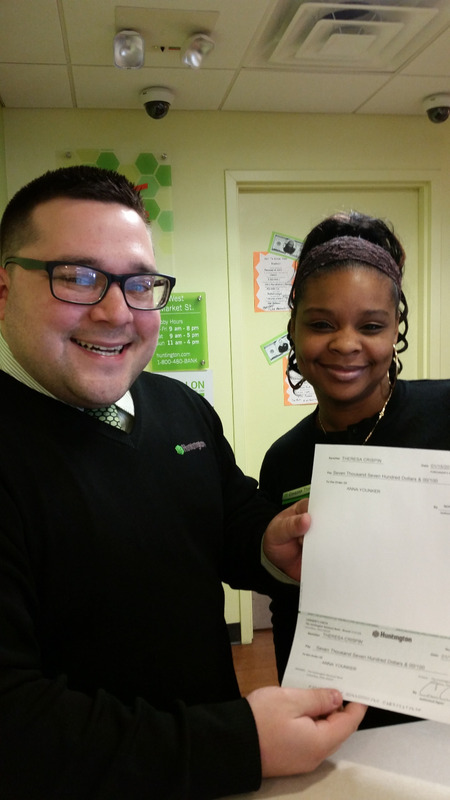 Cameron & Corazon from Huntington Bank in Montrose issuing a certified check for Anna & Coming Attractions. This one is for $7,700.00 - more to come! Channel 5 is supposed to be there tonight at the shop when I meet Anna for the first time and present her with the check that YOU all made possible! It is unfortunate that the CDC caused so much panic and the bridal shop had to take such drastic measure. However, AMBER DID NOT CANCEL HER ORDER. In fact, she had already purchased and picked up her wedding gown the day she was in the shop. She was there to order dresses for her bridesmaids. Due to all of the negative press, I believe some actions to cancel the bridesmaids dresses was taken. Interesting enough it took until January 2015 for Amber's veil to arrive although it too was ordered in June 2014. That's right, she purchased her gown and veil there . Let's be sure we tell the whole truth when telling the story. While I cannot afford a monetary donation at this time, I will be purchasing my daughters winter formal dress from Coming Attractions to help bring them some business. I know I am only one person, but change and help has to start somewhere! I am confused. Per interview with paper store is closing even with city's offer to help. What are the funds for ? I cant afford to help out, But im sharing the link. I hope the store can be saved. I hate too see a local business close due to this! I shared on Facebook, and also posted link to this on the Yahoo news article where I first saw it. Great news Terri. I tweeted this to Bill Wills, the morning show host on WTAM 1100AM in Cleveland and he retweeted it! I bought my beautiful wedding dress there. 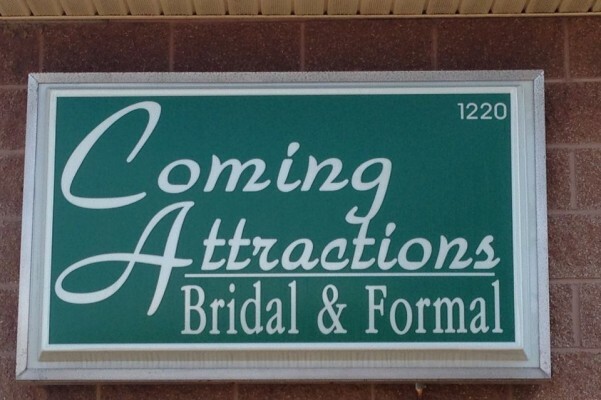 Always the first words out of every bride Corning Attractions. . Let's go. I hope she can pull through. She should be able to sue AMBER. The woman knew what she was doing, and insisted on putting others at risk. This shop owner will lose her and her employees livelyhood for doing the RIGHT thing. Sending support and sharing in Vancouver and Victoria, Canada. Hope to help you out, and combat ignorance about Ebola. Love! Thank you everyone for your donations thus far. Everyone's support means so much to us. We never expected anything like this. The support is overwhelming!! Please donate!I just bought mm wedding dress here and was supposed to have my first fitting on Saturday. Please help keep them open!! Thank you for creating this. I hope others will share & hopefully save some of her small business. ITS TIME FOR POSITIVE MEDIA ATTN! As a bridal shop owner myself, I know this could happen to any of us really in any business...This is not about right or wrong, it's about saving one store that suffered a tragic loss - I hope people can do this for her. I am heartbroken for you. I hope that enough money can be raised to keep you in business. You deserve this money. I hope this helps to keep your business going! This shop is a staple in our community!